Kangaderoo Custom QR Code. 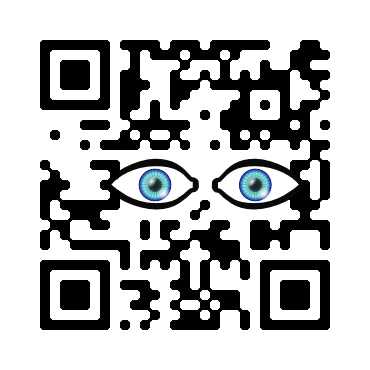 : The eye of the QR Code. Quote from the movie Minority Report: "Why didn't I know about this?" As soon as more and more people start using QR Codes, technical terms are thrown out the window and replaced by more popular term. I had a discussion the other day concerning graphical enhancement of the QR Code, were there was a constant reference to the 'eye' of the QR Code. It took me a while to understand that the reference was to the locators. The three squire shaped objects in the corners of the QR Code. With the popularity of QR Codes ever increasing, how long will it take before other technical terms regarding QR Codes will be replaced as well?